Healthy Christian doctrine has always rightly insisted that God’s work in Christ is all-sufficient. Furthermore, Christianity has additionally been clear that anyone or any group that requires belief in Christ plus other things or other people or other rituals or other revelations is heretical. What has been unclear at times is the awareness that no matter how important and necessary the cross of Christ is, it is clearly not the entirety of the Christian gospel. To put it starkly, Christ is all-sufficient, but his cross is not. The story of God’s work, his essential work, for humanity and his own glory did not end on Friday, with the shedding of, to uses Peter’s words, “the precious blood of Christ, like that of a lamb without defect or blemish” (1 Pet. 1:19). Nor did it end on the first day of the week, Sunday, with the resurrection of Christ. Almost by rote many believers think they are summarizing the entire gospel if they say “death, burial, and resurrection.” What about the enthronement of Christ? What are we to make of his enthronement, especially in the book of Revelation? Significantly for my thoughts here, it is noteworthy that the term cross does not occur a single time in Revelation, while the crucifixion of Christ is explicitly mentioned only once in Rev. 11:8. References to the blood of Christ do occur many times in the book, both because of its obvious role in securing “freedom from our sins by his blood” (Rev. 1:5), but perhaps also because of the very high number of references to the shed blood of the saints (e.g., Rev. 6:9-10; 16:4-6; 17:6; 18:24; 19:2). Just like a connection is made between the martyrdom of Antipas (Rev. 2:13) and the martyrdom of Christ by using the phrase “faithful witness” (ho martus, ho pistos, Greek ὁ μάρτυς, ὁ πιστός, Rev. 1:5; 2:13; 3:14) to describe only these two individuals in all of Revelation, so the references to the Lamb and the martyrs as those “slaughtered” (sphazō, NRSV; 5:6, 9, 12; 6:4, 9; 13:8; 18:24?) points to a solidarity of Christ and the martyrs. As we all know (I think), Christological emphases in the New Testament are crafted, in part, on the basis of the occasion and the contextual circumstances of the document in which they are found. Thus all the references to “blood” and “slaughtered” in Revelation may point to additional themes beyond atonement theology. Revelation has a robust presentation of the story of God’s gospel is his work through the enthronement of Christ. It strikes me as significant that the first thing affirmed about Christ in the literary setting of the two chapter “throne room” scene in Revelation chapters 4-5 is Christ’s connection with his Davidic heritage, “See, the Lion of the tribe of Judah, the Root of David, has conquered, so that he can open the scroll and its seven seals” (Rev. 5:5). Once this Davidic heritage is appreciated, then one sees the logical necessity of Jesus, certainly as the slain lamb, enthroned with God. Looking at other contexts in Revelation, it is no accident that the Christmas-Nativity drama of Revelation 12, just like the more “mundane” presentations of the Christmas-Nativity stories in the Gospels of Matthew (1-2) and Luke (1-2), cannot speak of the birth of the Anointed One without an inextricable association of the royal dynasty of David and the divine necessity of the enthronement of his heir. How much clearer could the association of Christmas-Nativity, Davidic theology, and Christ’s enthronement be than in John’s vision in Rev. 12:1-5? There the prophet correlates the reference to the birth of Christ with a Davidic Psalm (2:8-9) with these words, “to give birth . . . to a son, a male child, who ‘will rule all the nations with an iron scepter,’” (Rev. 12:5), and then in the same verse mentions the ascension and enthronement of Christ (“And her child was snatched up to God and to his throne,” Rev. 12:5). I certainly am not an advocate of theology based upon alliteration :-), but the more recent summary of the gospel story as “Cradle, Cross, and Crown” resonates better with the birth narratives of the Gospels and the book of Revelation than the “Cradle to the Cross” summaries I heard years ago during December. [I have not read The Cradle, the Cross, and the Crown: An Introduction to the New Testament, by Köstenberger, Kellum, and Quarles (2009), but I hope they have not too closely associated the “enthronement-crown” element with a pre-millennial approach to the NT, especially since enthronement Christology is also crucial for the Gospel of Luke, the Acts of the Apostles, Paul et al.]. Even though the robust enthronement perspective of the New Testament receives inadequate emphasis in modern western Christianity (if church architecture/art/sermons are any indication), it was well known in the early church. In Revelation it seems that even a spiritually deadhead, dullard, and deadbeat congregation like the one at Laodicea knows of the possible power of enthronement theology (Rev. 3:21). Generally scholars believe, and rightly so, that the individual promises made in the seven letters to those who overcome consist of terms and ideas well known to the readers and audiences in the time of John the prophet. Thus, when Jesus offered the Laodicean church a reward based upon his own prior enthronement, “just as I was victorious and sat down with my Father on his throne” (Rev. 3:21b), we can assume, I think, that this was not gospel information previously unknown to them. Furthermore, it would need to be a significant element in Christian theology in order to serve as the foundation for the crucial promise “To the one who is victorious” (Rev. 3:21a). With the 25+ references to the Lamb in the book of Revelation it goes without saying that the Lamb Christology is a dominant one in the book of Revelation. There are notable exceptions to its normal primacy, and these are significant. The leading Christology, to give one example of an exception, is the Christology for the letters to the seven congregations which is not the lamb, but the horrific “Son of Man” revealed in the Christophany of Rev. 1:12-16. In fact, the Lamb terminology does not even appear explicitly in Revelation until chapter 5. So, as one thinks about the prophetic messages of Revelation and John’s Christological emphases, I have no interest in contributing to the diminution of “atonement through the blood,” but I do want to emphatically claim that Friday is not enough for us believers, and neither is Sunday. According to Luke, “over a period of forty days” (Acts 1:3) Jesus appeared to the apostles following the resurrection and then he ascended and was enthroned. And it is in the position of the enthroned Davidic king, with his feet on the neck of God’s enemies as described in Ps. 110:1 and referred to in Mark 12:36; Acts 2:34; Heb. 1:13; Eph. 1:20; Col. 3:1; and 1 Pet. 3:22, and not in the position of one on a cross, that Christ is given to the church as its head (Eph. 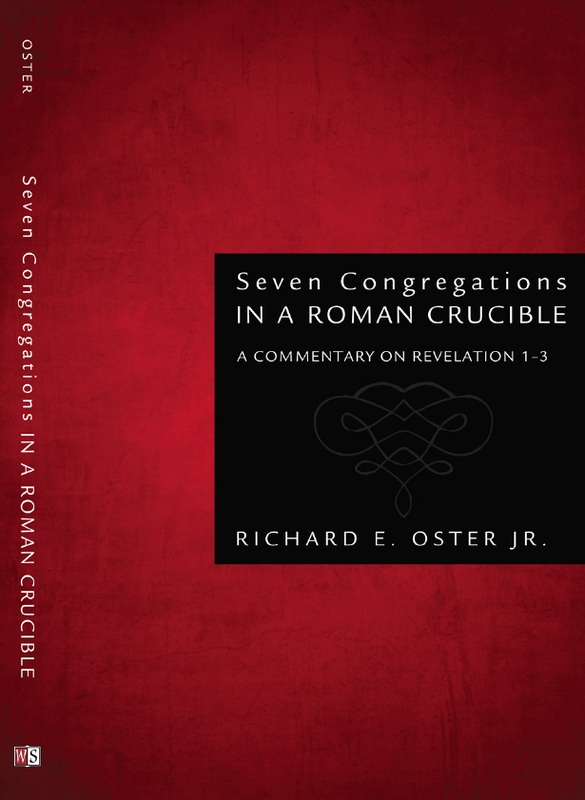 1:20-22; in general see Richard Oster, Seven Congregations in a Roman Crucible, pp. 11, 78, and 197!). Maybe, just perhaps, more believers today would be willing “to follow the Lamb wherever he goes” (Rev. 14:4), if they, likewise, embraced the full-bore gospel, including the enthroned Son. If my memory is correct, N.T. Wright makes a case in his book “Surprised by Hope” for Christians to give attention to the ascension of Christ like they do the crucifixion and resurrection, since the enthronement of Christ is equally important to the proclamation of the gospel. Any ways, good post and a good reminder. I have run into people who have problems with enthronement theology up here in Boston. Many feel that an enthroned Christ is too imperialistic and represents everything wrong, in their opinion, with Christianity and its history (I vehemently disagree). Instead of an enthroned Christ, these people would rather follow a slain lamb who is impotent and thus only dies for their sins. I guess that makes them feel better about themselves. As I rember (and I may be doing so poorly) you would stress that in throne room scenes it is not the lamb on the throne, but the lamb before the throne with God the Father upon it. These comments tended to be in the context of theological emphasis vs Christological emphasis discussions. I guess I’m searching for clarity on the interplay between enthronement theology and a lamb that is not described as being on the throne (or a correction on the placement of the lamb on the throne room). Overall the book of Revelation is theocentric [as is all of Scripture]. When, however, the Son is carrying out various ministries/tasks/parts of God’s divine plan the reader better appreciates what God has done if he discerns the various stages of events in redemptive history. If we view it as all crucicentrism, then we miss the various emphases that God intends for us to grasp. In Revelation the Lamb is enthroned, but on God’s throne and especially as the result of God’s actions. Ps. 110:1 makes it clear that the Anointed One is seated next to God in response to God’s imperative. Thanks for visiting the blog; sorry it took so long to get back to your good question for clarification. Thanks Richard, for making a valid point. If it were not for the exact sequence of events: crucifixion, death, burial, resurrection AND “enthronement” the gospel message is incomplete. Plus, the fact that God could not have sent the Holy Spirit per Pentecost if the Lord Jesus had not ascended to the right hand of the Father. Therefore, EACH one of the things you mentioned [the cross, Jesus’ death, burial; His resurrection AND ascension [unless a person wants to do an individual study of just one of them, which is ok] are absolutely necessary. Otherwise, the Gospel is not complete. So, we need not place emphasis on just one or two of these events, because ALL of them together give us the full picture of Christ and Who HE is. Thanks so much for the visit to my blog and your comments in response to it. Your last sentence makes the same point I was attempting to make from Revelation. Thanks for your reply and visit to the blog. We are on the same page in seeing the need to emphasize that all these events are equally significant. Terrell, Thanks. So, next year I expect an ascension-enthronement sermon about 40 days after Easter Sunday. Think about it! Thanks for a friendly call–I just put it on my preaching schedule. Having 10 months to plan it leaves me with no excuse! Now I teach my Bible class, on Hebrews: Hebrews tells us the story backwards. It begins with the Resurrected Son on the Throne in chapter 1, and then tells of the Man Jesus on earth in chapter 2. The witnesses are the reason we know and believe. The Throne is why we endure and obey. Leave those out and we have but an inspiring story. You were very, very fortunate to have a Bible teacher who understood the importance of the enthronement of Christ. Interestingly, the last publication of Alexander Campbell was on the Gospel and it included the ascension and enthronement of Christ.